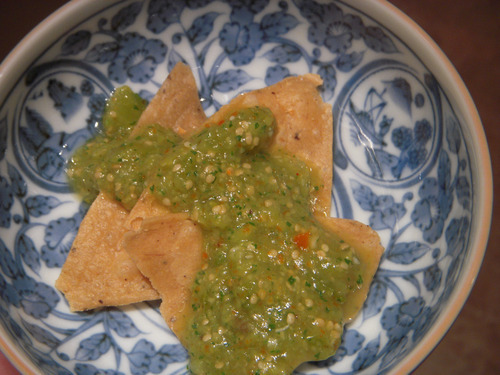 Tomatillos are another item that I’d tried before in salsas and sauces, but that I’d never personally cooked with. 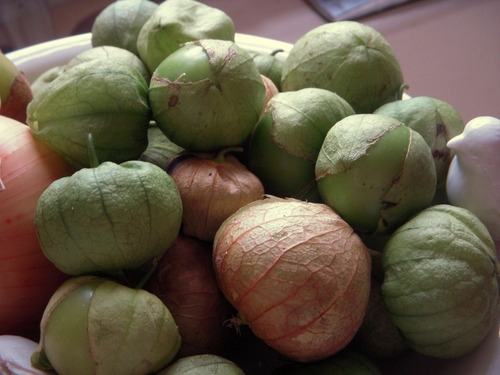 Tomatillos are a member of the tomato family, and the fruit is surrounded with a paper-like husk. Amy from Living Stones Community Farm gave a ripe yellow tomatillo to Cara and me to try during a visit to the Downtown Ypsilanti Farmers’ Market, and from the first bite, it was a party in our mouths! It was sweet, yet tangy at the same time, and I knew I had to bring home a batch to turn into salsa. 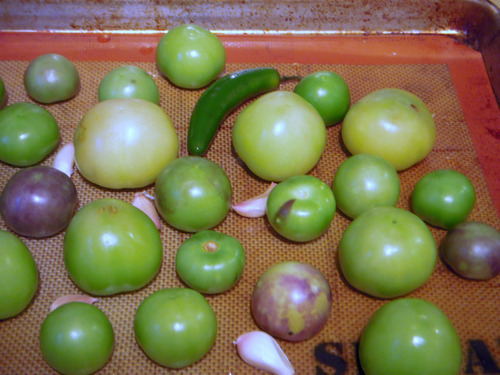 Amy mentioned that she liked to roast tomatillos, so after removing all of the husks and washing them, I roasted them along with a serrano pepper, and a few cloves of garlic until the tomatillos were toasty brown on the tops. I threw all of that into my food processor (about half of the tomatillos were tossed in whole, and the other half had their “guts” removed so the salsa wasn’t too watery) along with a generous handful of green olives and fresh cilantro. I probably would have added lime juice too, but I knew that I would be eating the salsa with Ann Arbor Tortilla Factory Lime Chips, and I decided that it wouldn’t be necessary! Karl and Cara also enjoyed some of the salsa the next morning on scrambled eggs – it’s delicious however you decide to use it! This entry was posted in In the Kitchen (recipes & more) and tagged downtown ypsilanti farmers' market, farmer's market, lindsay jean hard, Living Stones Community Farm, local food, locally grown, Real Time Farms, salsa, tomatillos. Bookmark the permalink.